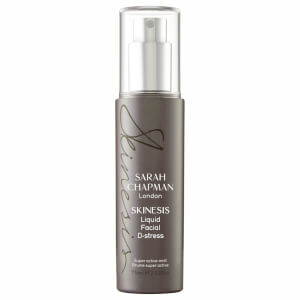 Treat your complexion to The Home Facial from Sarah Chapman. The skincare gift set includes a deeply moisturising mask, an award-winning facial treatment and the brand's innovative Facialift roller tool. 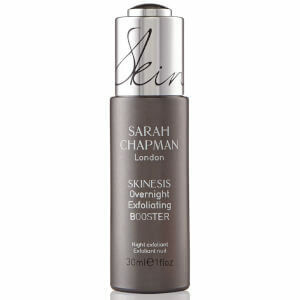 An award-winning night-time treatment dedicated to lifting, firming and revitalising the look of skin. 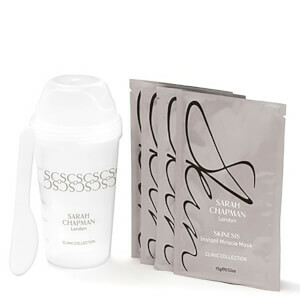 With a silky soft, serum-oil texture, the elixir really brings home the skin perfecting benefits of a Sarah Chapman facial; combining exotic essential oils with potent antioxidants and peptides to plump out dull, 'flat' skin for a youthful appearance. Ideal for those concerned with ageing skin, the innovative formula will promote a brighter, more balanced complexion, smoothing out lines for younger-looking, radiant results. With a powerful formula that combines low molecular weight Hyaluronic Acid and Rosewater, the face mask smoothens the appearance of fine lines and wrinkles and delivers intense hydration for a plumped, luminous appearance. Its radiance-reviving Pentavitin® complex replenishes moisture levels to transform dull, thirsty skin. Suitable for use on all skin types, the specially designed mask treatment fits all face shapes, and the unique flaps soothe the delicate eye area. A unique massaging tool that mimics the fast-tapping, pinching and knuckling techniques of the brand's Skinesis massage. Designed with a wishbone shape, 8 wheels and 48 nodules that roll effortlessly over the skin to refine and tone facial contours, whilst encouraging circulation to leave you with a healthy-looking glow. The small disc can be used to energise and awaken skin. With regular use, the supply of vital nutrients and oxygen is improved, so you can experience a radiant, revitalised complexion and sculpted features. Tratamento Facial Noturno: espalhe 2 doses sobre o rosto e o pescoço. Inspire o aroma celestial. Máscara: aplique no rosto limpo. Retire a máscara da saqueta e desdobre-a. Retire as camadas protetoras externas. Alise a máscara sobre todo o rosto. Cubra os olhos, se necessário. Deixe a máscara atuar durante 10 a 15 minutos. Retire a máscara e massaje o remanescente do sérum na pele. Facialift: deixe que o massajador se abra alcançando ambos os lados do seu maxilar. Empurre e deslize-o do queixo na direção das orelhas. Concentre-se na metade inferior do rosto, evitando que role sobre as maçãs do rosto. Empurre e faça rolar sobre cada um dos lados do seu pescoço, da frente para trás e para cima e para baixo, nos lados. Segure as esferas e use o disco plano para dar suaves toques por todo o rosto para aumentar o fluxo sanguíneo. Concentre os toques nas áreas mais ossudas e à volta dos olhos. Overnight Facial: Simmondsia Chinensis (Jojoba) Seed Oil, Cetearyl Ethylhexanoate, Cyclopentasiloxane, Cyclohexasiloxane, Di-PPG-2 Myreth-10 Adipate, Caprylic/Capric Triglyceride, Tetrahexyldecyl Ascorbate, Ethylene/Propylene/Styrene Copolymer, PEG-4, Phenyl Trimethicone, Limnanthes Alba (Meadowfoam) Seed Oil, Crambe Abyssinica Seed Oil, C12-15 Alkyl Benzoate, Cannabis Sativa Seed Oil, Butylene/Ethylene/Styrene Copolymer, Tocopheryl Linoleate/Oleate, Tocopheryl Acetate, Hydroxycinnamic Acid, Ubiquinone, Tribehenin, Teprenone, Retinyl Palmitate, Ceramide 2, PEG-10 Phytosterol, Thioctic Acid, Palmitoyl Hexapeptide-12, Adansonia Digitata Seed Oil, Cedrus Atlantica Bark Oil, Parfum, Jasminum Officinale Flower Extract, Santalum Spicata Wood Oil, Citrus Paradisi Peel Oil, Pelargonium Graveolens Flower Oil, Cananga Odorata Flower Oil, Rosa Damascena Flower Oil, Dalbergia Sissoo Wood Oil, Anthemis Nobilis Flower Oil, Lavandula Angustifolia Oil, Citrus Aurantium Bergamia Fruit Oil, Linalool, Limonene, Benzyl Benzoate, Citronellol, Geraniol, Farnesol, Benzyl Cinnamate, Benzyl Salicylate, Eugenol, Benzyl Alcohol, Citral, Hydroxycitronellal. Mask: Aqua, Glycerine, Butylene Glycol, Rosa Damascena Flower Water, Saccharide Isomerate, Peg-40 Hydrogenated Castor Oil, Aloe Barbadensis Leaf Juice, Magnesium Aspartate, Octyldodecanol, Phenoxyethanol, Sclerotium Gum, Hydrolyzed Hyaluronic Acid, Mannitol, Ribes Nigrum Seed Oil , Allantoin, Dipotassium Glycyrrhizinate, Carbomer, Triethanolamine, Xanthan Gum, Helianthus Annuus Seed Oil Unsaponifiables, Sodium Citrate, Zinc Gluconate, Peg-60 Almond Glycerides, Caprylyl Glycol, Cardiospermum Halicacabum Flower/Leaf/Vine Extract, Tocopherol, Helianthus Annuus Seed Oil, Rosa Damascena Flower Extract, Iodopropynyl Butylcarbamate, Copper Gluconate, Rosmarinus Officinalis Leaf Extract, Acetyl Tetrapeptide-15, Nordihydroguaiaretic Acid, Oleanolic Acid, Citronellol, Geraniol.